Throughout the industry, those who are revered as legends are those who pioneered the medium in a way that no-one had ever done so before. Ron Gilbert helped prove that comedy was possible, Molyneux taught us about limiting our expectations, and – long after making a platformer about a green rabbit with a gun – Cliffy B revolutionised the way we hide behind cover and shoot things. One of the most recent graduates into our hall of fame is undoubtedly Goichi Suda – or Suda51 as he’s otherwise known – a man who has time and again proven that there can be a point to ultra-violence thanks to a series of titles that combine ridiculous, over-the-top action with insightful social commentaries and, occasionally, a save system accessed by taking a dump. After years of cult successes in the form of Killer7, both No More Heroes and arcadey zombie-slasher Lollipop Chainsaw, Suda is back with Killer Is Dead – a new title that keeps the blood flowing and sees you once again taking on the role of an assassin and swinging your weapon around until everyone around you is gone. Assuming the role of Mondo Zappa, players are thrust into the near-future where government-sanctioned murder is a wealthy occupation, and you are tasked with taking down various criminals and assassins from around the world. Taking place over the course of thirteen episodes – each with their own self-contained story but contributing to an over-arching plot – Mondo must hunt down his targets in what is promised to be a far more personal tale than that of Suda’s previous fare. Taking us to episode seven – where Mondo is expected to assassinate a powerful member of the Yakuza in Japan – we were shown the ropes to the upcoming hack ‘em up and given more details to how the stylistic slasher will play. Skipping the cut-scene and going right into the deep-end, we were introduced to enemies that allegedly came from the dark side of the moon, and assumed the form of ninjas, who were shortly dispatched thanks to liberal use of the X button, which will be the basis of the action on the 360 version of Killer is Dead when it launches later this year. Those now worrying that the action will just be intensive button-mashing should allay those fears, as that tactic will soon lead to frustration for many thanks to the adaptive AI, which will observe how you play and then react accordingly; blocking, dodging and countering your moves if you fight too repetitively. Mondo can likewise guard himself from the onslaught of his enemies, and he too can do this via dodging and countering. By guarding with the B button, he’ll put himself on the defensive, while moving him in any direction will see him dodge that way, allowing him to swiftly evade oncoming attacks. Timing is all-important too, as dodging at the right moment will allow Mondo to get his counter on and make short work of anyone who dares oppose him. Killing your foes will also have the added side-effect of building up your rose meter; a gauge in the upper-left of the screen that slowly grows as you absorb their blood, allowing you to either recharge your health, your adrenaline, or unleash a special attack. The amount you gather is solely dependent on the amount of enemies in each stage, so considered decisions will have to be made on-the-fly if you want to maximise your abilities. Adding to this is the fact that the manner in which you execute your opponents will dictate how you’ll will level up throughout your adventure, so it could easily be the case that by the end of the story your Mondo will play very differently to that of your friends. Another great addition to the combat is the Musclebacker; an arm cannon – akin to that of Samus Aran’s or Megaman’s – that is unlocked throughout the course of the story, and provides four colour-coded styles of fire, with one acting more like a machine gun and another firing a blast that stunned foes long enough for Mondo to get up close and execute them by cutting them in half. Although I’m not sure what the other versions of the Musclebacker do, it’ll be interesting to see if they’re used to balance the combat, rather than overly tip it in your favour. 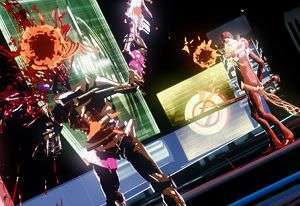 Iterating on the combat further is the combo system; rather than unlocking and purchasing different combinations throughout the story, Mondo actually has access to all of his potential combo attacks from the beginning, and they can be unleashed when the counter in the top-right of the screen reaches a certain level. Starting at level one, every ten successfully-landed hits that the player achieves without being damaged themselves will bump the combo level up until level five, wherein Mondo’s most dangerous and powerful attacks can be unleashed on your unwitting foes. Having the combos accessible from the start but the Musclebacker unlocked through more play seems like a very interesting compromise, and because the former depends primarily on your skill as a player and your ability to avoid attacks, it means that the combat should be a very tense but rewarding affair. 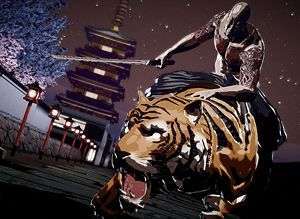 Equally so will be the boss encounters that should be present in every chapter, with chapter seven’s involving a high-speed chase between Mondo on a motorbike and the Yakuza riding a tiger. Once the foe’s health had been whittled down due to a combination of quick reflexes and deft sword-swinging, the battle became a one-on-one affair, with Mondo attempting to use all of the techniques he’d previously learned in order to best his foe. It was at this point that I found myself truly appreciative of the beautiful cel-shaded art-style; heavily reminiscent of Killer7 with some touches of No More Heroes, yet looking wholly unique and pretty in its own way, even as the claret began spilling everywhere. With the second stage of the fight over, we were stopped as the Yakuza began to merge with the tiger to form what would potentially be the final stage of the fight, and teased that we’d find out what would happen when Killer is Dead launched later in the year. With that, a video demonstrating the gigolo missions started to play. These side-missions are odd ones, used to help the protagonist acquire new upgrades, but to do so, first he must keep two meters up – that of his own lust and that of the woman’s interest. Raising the former requires Mondo to leer at the lady he is attempting to romance, but this will drop her interest in him if she catches him, so the trick is to do it while she’s looking away or employ a pair of X-Ray goggles to see her in a state of undress without her becoming aware. Using the goggles also clues you in as to what gifts she prefers, so that you can quickly seduce her and complete these missions sooner. Originally planned for Shadows of the Damned, they seem to make more sense in Killer is Dead, though it’s fair to say that, due to its content, it’s not something everyone is going to enjoy. With the preview done, I was given the opportunity to briefly ask Suda and director Shin-san a few questions about Killer is Dead before it releases this August. What was the primary inspiration for Killer Is Dead? With No More Heroes there was this very traditional story of a guy who is a bit of a loser who wanted to be a winner, and the second is about him getting revenge, but this title focuses on an executioner who does it because it’s his job, not because he’s trying to win someone’s heart. Suda51: I consider Mondo my tragic, dark hero if you will, and one of the reasons is – as you said – that he does this professionally as his job, but I also wanted to show the story and narrative of what goes on in the dark side of society that we will never never be able to witness for ourselves. Do you tend to think of the narrative first and then how you’re going to fit in the gameplay, or do you think of the gameplay first and write a story around that? 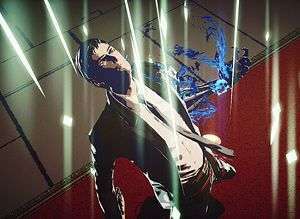 Suda51: I think the first thing when we built Killer is Dead would be the scenario and the story of the characters, but that being said we kept continuing to add gameplay throughout development, and in the end they were kind of moving in parallel, almost. There’s a great amount of complexity in terms of the combos and the Musclebacker, how difficult is it to find new ways to iterate on the design of your combat? Shin-san: I know it looks and might appear really complicated with the interface and everything, but the combat is actually a lot more simple, and what we had decided early on is that the focus was going to be on sword-fighting, and the Musclebacker is just to compliment that and add to the experience; we really designed most of the encounters and most of the focus is around the element of swordplay. With the Television format, was the emphasis more to tell multiple stories within the same world rather than one constant narrative? Suda51: So, Shadows of the Damned and Lollipop Chainsaw both followed the narrative throughout one night, and with Killer is Dead I really wanted to emphasise – like you say – a variety of situations and a variation of scenarios because Mondo himself is an executioner who must travel around the world, so we wanted to showcase each little piece as its own little story in the scheme of a grander narrative, so that’s why we arrived at the conclusion of an episodic narrative. 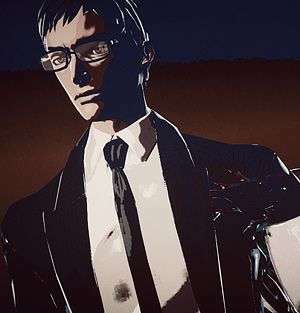 Killer is Dead is due for release in August 2013 on the Playstation 3 and Xbox 360 platforms, through Kadokawa Games in Japan, Xseed Games in North American, Deep Silver in Europe and Sony Computer Entertainment in Asia.